Looking for a new hobby? Check out Papercraft. This is hobby great for children and adults. It allows you to be creative, practice hand eye coordination and use your printer! Papercraft is the art of taking paper and using it to create three dimensional objects. A pattern is printed from your home printer onto printer paper. It is advised that you use a heavy paper such as card stock when printing out your patterns. After your pattern is printed, use crayons, markers or paint to decorate your project as needed. Some patterns can be printed in color and others are black and white leaving the coloring up to you. If using paint or markers allow your pattern enough time to dry before moving on with the project. Following the pattern you then proceed to cut out your object. Children are advised to use scissors when cutting out their project, but if you are able to handle using an exacto knife do so. Using an exacto knife will allow you to get a cleaner cut, improving your final outcome. After the pattern is cut out, apply glue to the glue tabs one at a time and fold your pattern to create a shape glue as you go. The pattern will indicate where you should start this process. If it doesn’t, practice before gluing by using a lightweight tape to hold the object together. Papercraft is unlike the well known practice of Origami which usually only involves folding paper to create and object. It is rare that glue is involved in Origami. There are a ton of patterns available online for all skill sets. 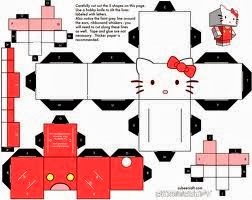 Just google “Papercraft Templates” to find one that is of interest to you. Then just click print and you are on your way. Let us know in the comments below, if you have ever tried Papercraft and where you go to get awesome patterns!